Last Sunday started off with beer tasting and it was only natural that I’d do pizza tasting a few days later. 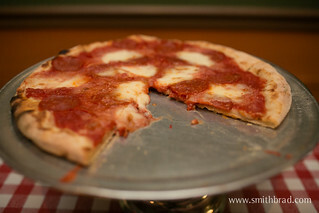 I went to a pizza event for Yelp at Federal Hill Pizza. I got there only a few minutes after it began and the first round of pizza was already gone. Womp womp. No worries though because I drank my complimentary beers and waited for the next round to come out. Pizza is my #1 favorite food and the pizza here is one of the best in the state of RI. I thought this pizza was fantastic even before this event. It’s close to neopolitan style – thin bubbly crust, light and simple crushed tomatoes as sauce, and good quality fresh mozzarella. He gives it a local twist by using a fermented starter to make to make the dough, and the crust is just slightly thicker than traditional neopolitan. I wish there was slightly less sauce though. He talked about how he thinks about minute details such as the fat content in the cheese to the kind of salt he uses. They also had these Italian-inspired wings. Looking at the plate, I thought it was just a fried chicken wing with marina sauce, like a chicken parmesan. Surprise! It’s more. The sauce had a buffalo sauce kick to it. The wings were perfectly cooked and fried too. Fact: Buffalo wings are my #2 favorite food. The first and last tips made my light bulb go off. The famous no-knead bread recipe? Part of what makes it a smashing success is the very high water content. I can apply it to pizza! As for using tiles in the oven, that’s what Julia Child recommended for making baguettes in your home oven. If I remember correctly, I think she also put water in the oven to create steam and the steam in turn helps create that crispy baguette crust. Putting all of this together supports the theory that I need to put more water into my pizza dough. Blah – this also means that I can’t just throw together pizza dough the same night I’m going to eat it and expect it knock my socks off.